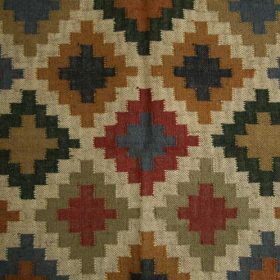 Kilim or Dhurrie? Dhurrie or Kilim? Although these two types of rugs were originally similar – because of the same weaving method – but different, today the terms Kilim and Dhurrie are almost interchangeable. Until the 1970’s Dhurries and Kilims were woven in different regions, but this is no longer true. Both are beautiful flat woven rugs usually made of wool and because of their weave, completely reversible. Kilim rugs were traditionally boldly colored and had geometric patterns, while Dhurries were more pastel and tended toward more flowing stylized designs. Today these design differences may determine whether a rug will be called a Kilim or a Dhurrie, with some overlap. But what one shop may call a Dhurrie, another will refer to as a Kilim. We call them all Dhurries. Whether you choose soft watercolor shades or bold tones is a matter of taste, but both of these rugs will hold up well in high traffic and heavy use areas. Have a look at our range of Indian dhurries and Rajasthani rugs here. This entry was posted in Blog and tagged India, Rugs, textiles.